Norlan is where the Sundering Wrath campaign is set, on a small continent or large island, located somewhere in the northern hemisphere. Very roughly speaking, the land is split in two. On the east (right) side you’ll find the Civilized Lands: Lorgas, Arathor, Wynnia and Meralis. These four kingdoms have managed to survive and strengthen each other through a strong alliance based on the common goal of taming the wild. Much of the Wild still remains untamed, however, as the western part of Norlan is a testament to. The land on either side of the mountain range that runs the western side is full of danger. To the south, deep woods and hills house numerous tribes of Orc, Troll and Ogre. They fight their own wars and stay away from the Civilized Lands. Just north of there, the Valley of Bones is an expansive ancient battlefield, now a place of great evil. The Dwarven kingdom Lorgas borders the other side of the valley. Here, an enormous wall keeps the horrors of the Valley of Bones out. The only way in or out is through the Ancient Gate, guarded by a dedicated order of Dwarven knights. Far on the western side of the mountains, you will find Corennia. These lands were settled by hopeful pioneers, seeking fame and riches by establishing dominions here. The taming of wild has yet to be completed in Corennia, where no actual kingdoms have formed. Instead, the lands are ruled by local lords, who control however much their forces are able to patrol. These nobles often spend a lot time on fighting each other over supply lines and natural resources. South of Corennia are the Western Foothills, a large highland area where giants rule. As for the mountains themselves, no sane man would ever venture there. There are rumors of immense treasure hidden among the ancient ruins there, but also tales of dragon nests and some say that the sleeping volcano is actually a doorway leading straight to the Elemental Chaos. 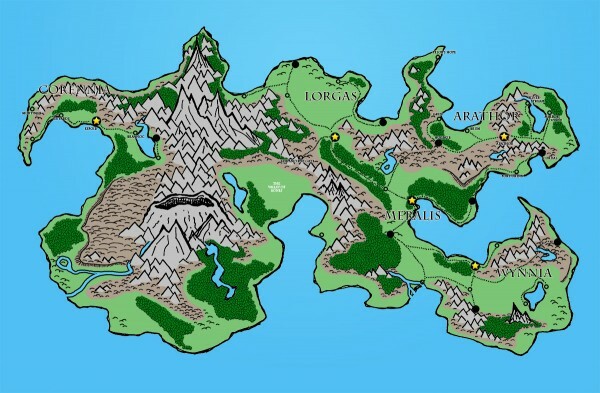 In ancient times the Norlan Continent was settled and ruled by Tieflings and Dragonborn. Eons after these empires crumbled, the Dwarves of Lorgas, Elves of Meralis and Halflings of Wynnia were separate and fighting to survive against the savages of the Wild. It is said that Man was the race that forged the alliance which would eventually tame the Civilized Lands. In return, the Dwarves who were the strongest of the races, gave the Human newcomers their own land, Arathor. Together, the four kingdoms vowed to help and protect each other against the savages and monsters, and for two centuries this alliance has held civilization together. I made this continent with a few key points in mind. I wanted to have stable kingdoms as part of the setting. These make for good starting points and low-level adventures. Also, I like using royalty, nobles and lords in my game, as both patrons and villains. Secondly, I wanted a different type of land, still settled by Man and his allies, but not civilized per se. A frontier, if you will. This was directly inspired by moving to the west coast and learning more about the early pioneer days. I wanted that whole Western feel, except put into a fantasy setting of course. I also needed some seriously dangerous lands, and my first thought went to a mountain range with a volcano. Again inspired by where I live, the Pacific Northwest certainly has its share of mountains and volcanoes. This is the type of place where I imagine really scary things living mostly undisturbed lives, like dragons and giants, and deep caves leading into the Underdark. The volcano has potential for many different uses – I’m purposely leaving that open until I actually use it in the game somehow. As a game world, Norlan is really not big enough. If this were the only continent, there would either be a lot of ocean or it would be a tiny planet. So in the game, I have mentioned other continents from time to time. This is so I can integrate Norlan into any existing game world later, if I want to. The map is big enough however, to get the campaign all the way through the Heroic tier.